^ Douglas, Matthew M.; Douglas, Jonathan M. (2016-01-01). Exploring Human Biology in the Laboratory. Morton Publishing Company. p. 324. ISBN 9781617313905. ^ Zubova, Alisa; Chikisheva, T; V. Shunkov, M (2017-01-01). "The Morphology of Permanent Molars from the Paleolithic Layers of Denisova Cave (in English)". Archaeology, Ethnology & Anthropology of Eurasia. 45: 121–134. doi:10.17746/1563-0110.2017.45.1.121-134. ^ "Homo sapiens ssp. Denisova". Taxonomy Browser. NCBI. Retrieved 2015-10-28. ^ "Taxonomy – Homo sapiens ssp. 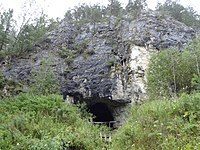 Denisova (Denisova hominin)". UniProt. Retrieved 2015-10-28. ^ Harmon, Katherine (August 30, 2012). "Humans Interbred with Denisovans". Scientific American. Retrieved 2016-08-24. ^ Ovodov, ND; Crockford, SJ; Kuzmin, YV; Higham, TF; Hodgins, GW; van der Plicht, J (July 28, 2011). "A 33,000-Year-Old Incipient Dog from the Altai Mountains of Siberia: Evidence of the Earliest Domestication Disrupted by the Last Glacial Maximum – First paleontological survey was conducted by N.D. Ovodov in 1975". PLoS ONE. 6 (7): e22821. Bibcode:2011PLoSO...622821O. doi:10.1371/journal.pone.0022821. PMC 3145761. PMID 21829526. ^ Brown, Samantha; Higham, Thomas; Slon, Viviane; Pääbo, Svante (March 29, 2016). "Identification of a new hominin bone from Denisova Cave, Siberia using collagen fingerprinting and mitochondrial DNA analysis". Scientific Reports. 6: 23559. Bibcode:2016NatSR...623559B. doi:10.1038/srep23559. PMC 4810434. PMID 27020421. ^ Zimmer, Carl (2013-12-18). 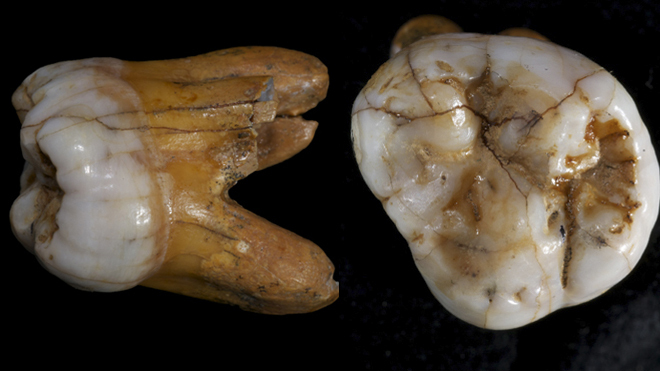 "Toe Fossil Provides Complete Neanderthal Genome". The New York Times. ^ Kuhlwilm, Martin; Gronau, Ilan; Hubisz, Melissa J.; de Filippo, Cesare; Prado-Martinez, Javier; Kircher, Martin; Fu, Qiaomei; Burbano, Hernán A.; Lalueza-Fox, Carles (2016-02-25). "Ancient gene flow from early modern humans into Eastern Neanderthals". Nature. 530 (7591): 429–433. Bibcode:2016Natur.530..429K. doi:10.1038/nature16544. ISSN 1476-4687. PMC 4933530. PMID 26886800. ^ Rasmussen; et al. (Oct 2011). "An Aboriginal Australian genome reveals separate human dispersals into Asia". Science. 334 (6052): 94–98. Bibcode:2011Sci...334...94R. doi:10.1126/science.1211177. PMC 3991479. PMID 21940856. 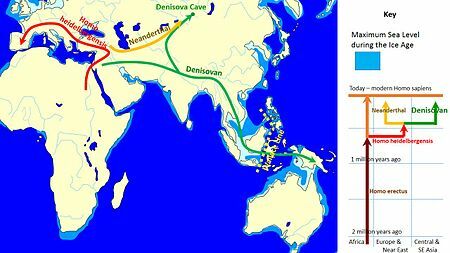 ^ "Our ancestors mated with the mystery 'Denisovan' people – twice". New Scientist. 2018-03-15. Retrieved 2018-03-20.